Imagine you are floating on a bed of warm water. You are about to experience a complete aromatherapy body massage – but you aren’t going to turn over even once! Lying on two pillows of warm water, kept at a pleasurable 35 degrees, you remain face up throughout the entire treatment. No more uncomfortable face holes. Your whole body is supported in perfect spinal alignment. The usual disruption of turning over just as you are completely relaxed, is avoided. . . only the sensation of floating and the feeling of warmth envelopes you. Hydrotherm involves a unique three-dimensional massage technique, which allows the therapist to slide their hands under, over and around the clients body in an uninterrupted motion. Through water displacement rather that through physically lifting the client, the Hydrotherm permits the therapist to work with the clients body weight as the source of pressure, facilitating a deeper, more holistic massage technique. he relaxing warmth of the Hydrotherm promotes an immediate sensation of well being, enhancing the therapeutic effect of the massage. The gentle heat increases circulation and the removal of toxins and improves the efficacy of aromatherapy oils, since the warmth generated by the Hydrotherm activates the essential oils and accelerates their absorption into the skin. The advantages of a Hydrotherm massage are numerous. Quite apart from achieving new heights of relaxation during a comfortable, undisturbed treatment, consider the benefits to those clients who cannot physically lie face down. Pregnant clients, the elderly and clients with impaired mobility, can fully appreciate a Hydrotherm massage without the discomfort associated with a conventional massage. 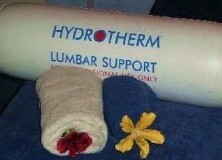 Hydrotherm is extremely beneficial as the soothing warmth eases the muscles for treatment.